Meelmore is an odd critter. 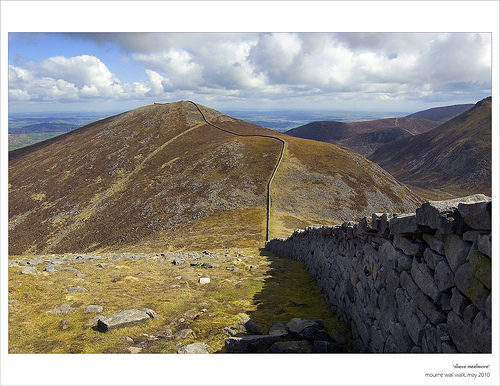 To all intents and purposes, she is fairly dull, although she can surprise you with postcard views along the ridge to Donard and in the winter, her Eastern flank is a glistening must. 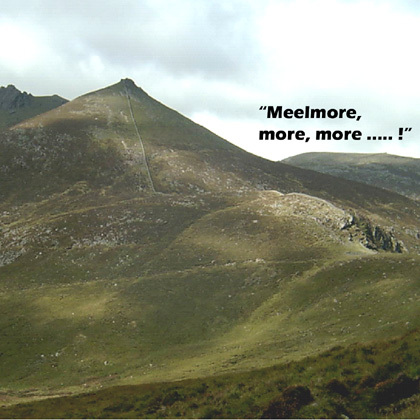 She is a big hill and so, inspired, the cartographer entitled her, “Meelmore”. She is neighbour to the more ostentatious Bearnagh and sibling of her smaller sister - yup you got it: “Meelbeg”. From some angles, it really is a strange beast.. kind of like a beached whale or the back of an elephant. Whatever it is, it had loads of people scurrying up, down and around it! 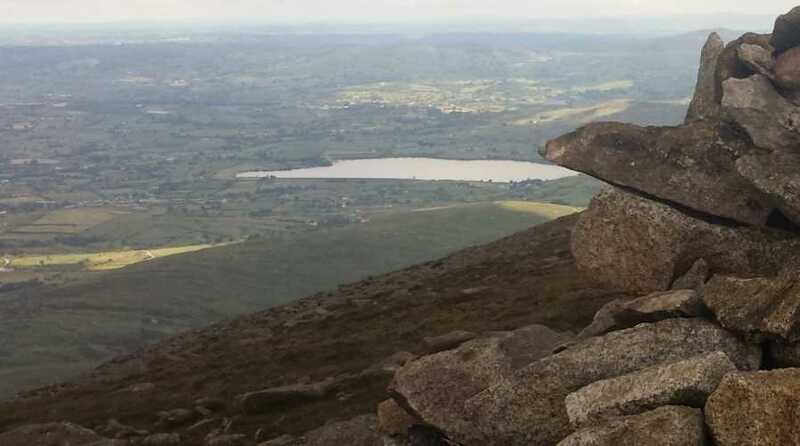 For summit baggers, there are huge gains to be made with Carn, Loughshannagh, Meelbeg, Meelmore and Bearnagh so close to each other and the walking (with the exception of that climb up Bearnagh) pretty easy going. As for that climb up Bearnagh! From Meelmore it looks impossibly steep, ridiculous even! Even glancing across at it was causing my legs to cramp so I decided to cross the wall and take a dander up to the summit proper of Meelmore to take my mind off the task ahead. That summit lies a hundred metres or so away from the watch-tower (what exactly was 'watched' from these towers?) and is marked with a cairn. My 'quiet time' at the top was interrupted by that rarest of creatures, a fell runner, and before I had time to raise my hand to salute him, he was off round the corner and was descending towards Bearnagh in what I can only describe as an uncontrolled and impossibly fast stumble.